This is the second article in a 5 part series showing you how to enjoy a truly unforgettable, Paris experience on a modest budget. Part 1 , discussed how to save money by traveling in low season, and covered tips on earning frequent flier miles, even if you rarely fly. Accommodations will be a large portion of your vacation expense. For about $80 USD per person per night, you could stay in a very small, double room in a 2 star, bare bones hotel. But, for the same price, you can enjoy an upscale Paris apartment, in a prime location, with full kitchen and Eiffel Tower views. Yes, that’s right! For the same price! 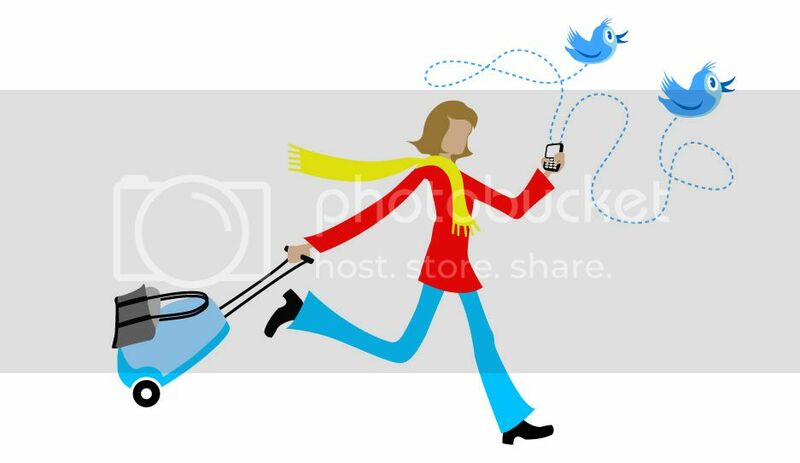 The trick is to travel with a few friends or family members, and consider low season instead of high. Why Choose an Apartment over a Hotel? Washer/dryer for laundry – convenience and savings of free laundry, allows you to pack less, and return home with clean clothes! Ask if they have an onsite management company to address any concerns; are they open 7 days a week? Most apartments require full payment in advance; ask what recourse you have if you find the apartment unacceptable. Will they move you to a different unit, or refund a portion of your stay? Carefully consider the location, noise level, and view. Verify the location through Google Earth. “Close” or “nearby” may actually be 2 miles away from your desired location. 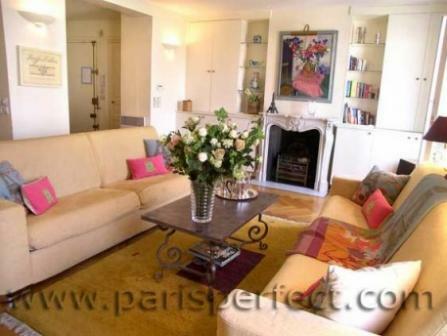 Why Choose a Paris Perfect Apartment? There are many apartment rentals in Paris, but for my money, I choose Paris Perfect apartments, a collection of 45 luxury apartments in prime locations in Paris. What sets Paris Perfect apart is that all apartments are professionally managed by Paris Perfect, with the highest attention to detail, and that “wow” factor to make your vacation a once in a lifetime experience. 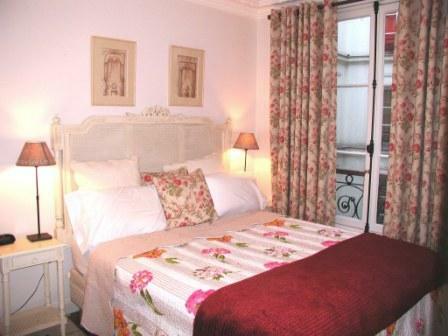 Paris Perfect apartments have been recommended by Rick Steves, Travel & Leisure, Fine Living Channel. complimentary consultation with your personal Paris concierge, who can arrange special reservations for Paris fashion shows, cooking lessons, private guides to take you antique shopping, massage appointments, restaurant & shopping recommendations and more! 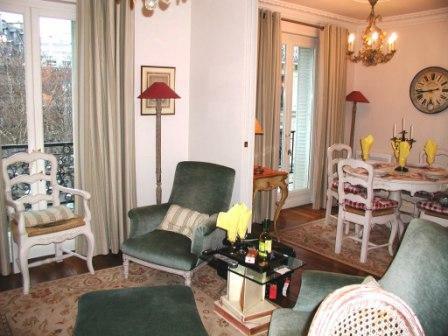 2) Two Couples – A great way to share expenses while enjoying a luxury apartment in the best locations in Paris. 3) Families – perfect when traveling with children. 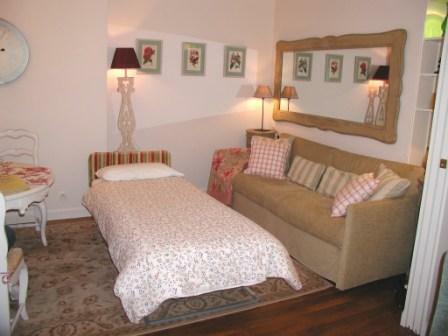 Triple and quad rooms are very hard to find in Paris, and when you do find them, they will be very cramped. 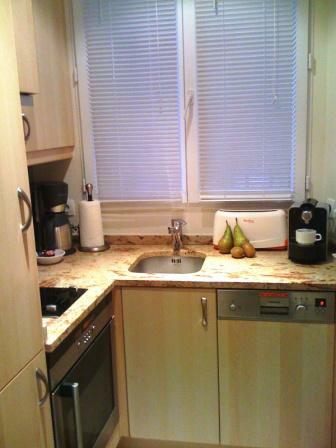 For the same price as two drab double rooms, you can have a lovely, private apartment, and save hundreds of Euros by enjoying breakfast and snacks in your kitchen instead of dining out 3 meals a day. The money you’ll save by eating in will more than offset the accommodation price. Paris has an undeniable “cool” factor for tweens and teens. 4) Multi-generational – Great for grandparents to bring along grandchildren-what a grand introduction to the City of Light! 4) Celebrations – honeymoons, engagements, anniversary, birthday, graduation. 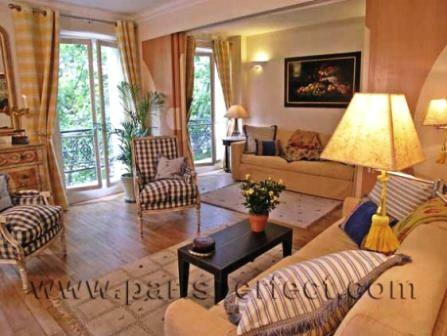 I have personally stayed in the St. Julien short term Paris rental, and it is gorgeous, in a prime location in the 7th arrondissement, just a few blocks from the Eiffel Tower, with a partial view through the tree tops. This is the Rue Cler neighborhood recommended by Rick Steves. The St. Julien sleeps 5 comfortably ($86 per person, per night*), is a little tight for 6 ($71 per person, per night*), and would be very spacious for 4 ($107/pp pn*). It has two full marble bathrooms (important for your “getting ready” space), plus a powder room in the hall. St. Julien has one bedroom and a double living room, with sliding doors for privacy, and a special, custom made Italian sofa which makes out into two full sized, extra long comfortable, single beds. I have slept on this sofa bed myself, and I can assure you, this is not your grandma’s fold out sofa bed. There is also a fold out sofa bed in the first living room, recently upgraded, but I haven’t slept on that so I can’t personally comment on it. I’m sure it would be fine for one. 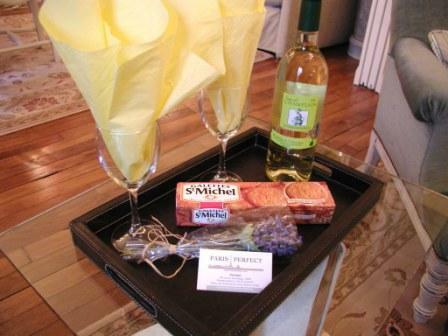 Most recently, we stayed in the Clairette Paris flat in the same building as St. Julien. The Clairette has an incredible view of the Eiffel Tower (2 blocks away) from the two sets of large French double-glazed doors, with step-out balconies. Every detail is exquisite: beautiful furnishings, gorgeous wood floors, oriental rugs, with decorator touches everywhere. Lighting – an effective mix of crystal chandeliers, halogen lighting in the kitchen, and many table and floor lamps make the apartment so cheerful. The dining area is in the double living room in the Clairette, with the same high quality sofa that makes out into two separate comfortable single beds. 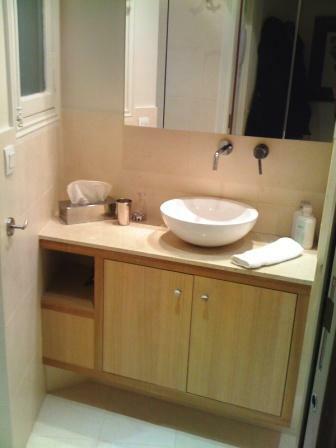 Cream travertine in the bathroom with large walk-in shower, modern vessel sink, heated towel racks, hair dryer. Thick, white fluffy towels, and an extraordinary find for Europe = Washcloths!!! Americans will be very happy! 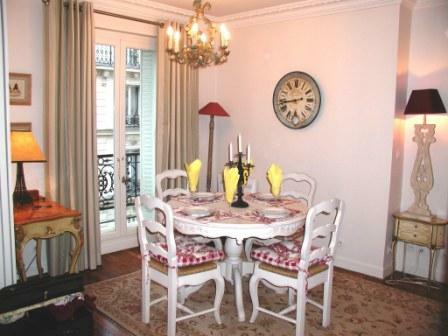 I’ve not yet stayed at the Bordeaux luxury apartment in Paris, but knowing the neighborhood and quality of furnishings, it looks like a great choice for 6, with 2 bedrooms, double living room, 2 full and 2 half baths, and the same heart-stopping views of the Eiffel Tower that Clairette enjoys. And at 2065 Euro/week in off-season, that works out to $71 per person/per night, or $142 per couple. An absolute steal!!! If your budget allows, of course, consider prime season as well. Picnicking in the Champ de Mars park right next door, evening strolls along the Seine…an unforgettable experience. 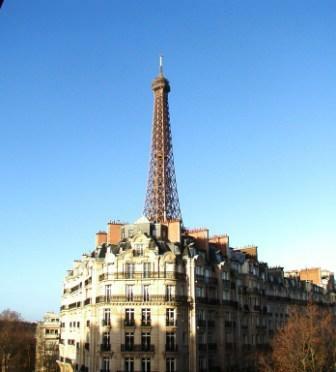 Paris Perfect apartments are running a special promotion on high season rates now as well. Check their website for details. The Left Bank location of these 3 apartments is perfect! Literally 2 blocks from the Eiffel Tower/Champ de Mars, major bus stops across the street, Metro and RER just a few blocks away. 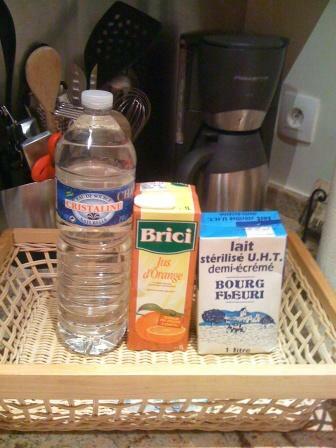 Paris Perfect vacation rentals provides guests with welcome gifts of milk, orange juice, water, and a bottle of wine. 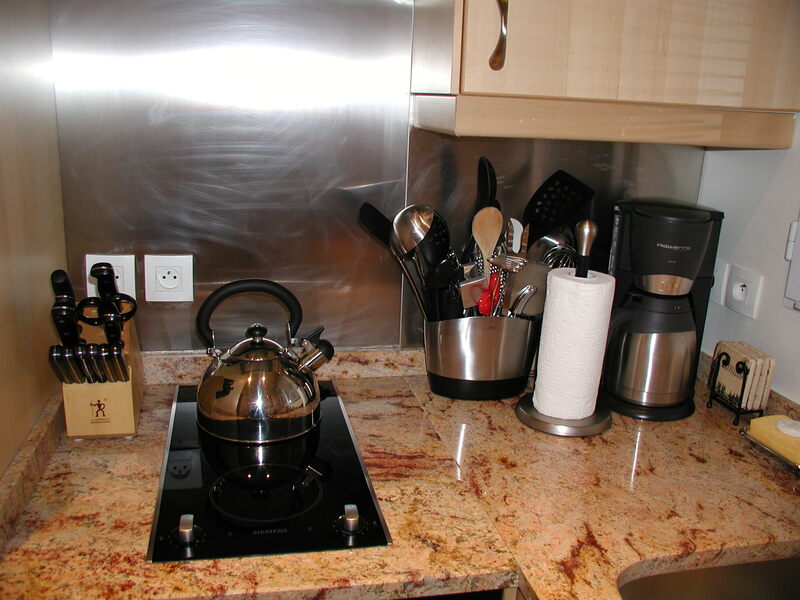 The kitchen is already supplied with basics: regular coffee pot and filters; olive oil and vinegar, salt and pepper; and my favorite – a Nespresso machine with a starter supply of coffee capsules in assorted flavors – another way to easily save $4-5 for each cup of coffee you don’t have to buy at a café. Kitchens in these 3 apartments are high-end, with granite countertops, dishwasher, microwave, stove, oven. Dishes, glassware, champagne and wine glasses are provided, even colorful plastic dishes, cups and bowls to help the kids feel right at home. 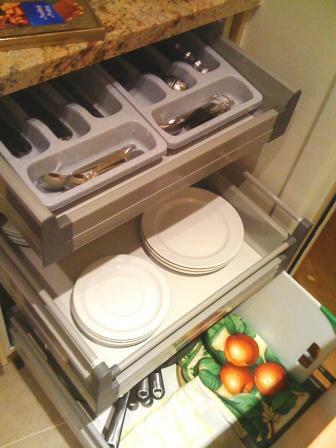 A full set of Henckels knives, serving ware, mixing bowls, cutting board, storage dishes, glass baking dishes, salad spinner, etc. are included. A washer and dryer are in each apartment, along with laundry soap, allowing you to pack lighter than usual, since you wash your clothing on the go. You will be met personally by a professional, friendly Paris Perfect greeter, who spends nearly an hour with you, showing you all the workings of the apartment, answering any questions. In addition to your personal greeting, each apartment comes with a complete, thorough, personalized guide book, which explains in great detail the workings of every appliance, system, etc. It also has a wonderful 32 page section on sightseeing. 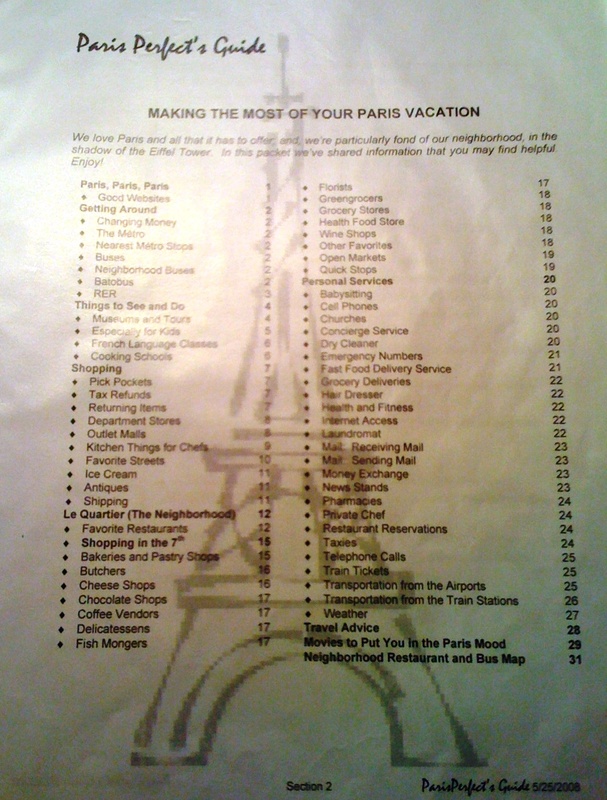 This was my “bible” while in Paris, as it included everything! 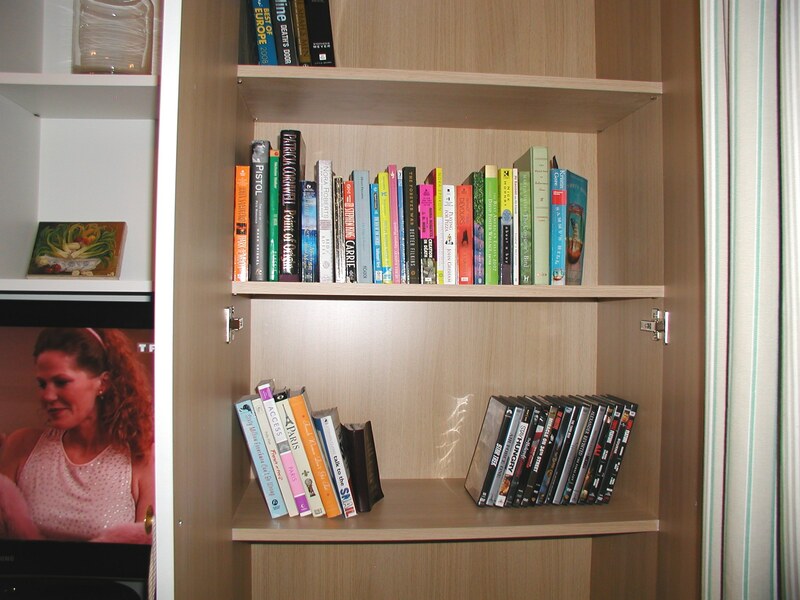 Paris Perfect Luxury Apartments include flat screen TVs with cable access, DVD player, and a supply of DVD movies, novels and Paris guidebooks for your enjoyment. Free wi-fi had great bandwidth too. We had four devices connected on wi-fi at the same time ( iPhone, 2 iPod Touches, 1 laptop) and no hiccups or slowdowns. Free phone calls included from your apartment’s phone to all landlines and cells in US/Canada, and to landlines in Europe, Australia, & New Zealand. Grocery stores very close by. If you’re staying in either of these 3 apartments near Rapp/Bourdonnais, you have a G20 market just a few doors down, and a larger FranPrix just a 4 minute walk down Bourdonnais. Paris Perfect includes a rolling market basket so you can shop just like a local. Did I mention the Boulangerie is 3 doors down? Pop down in the morning for your fresh, warm baguette and flaky croissants, to enjoy with your Nespresso. The prices quoted are fully inclusive, there are no taxes, service charges or occupancy fees. Potential drawbacks for some could be that there is no daily maid service, towels are not normally replenished (but there are extras provided, and you are free to wash a load of towels in your washer/dryer if you wish). Maid and laundry service can be arranged for an extra fee, as well as a personal chef, if you really want a splurge. Full prepayment is required in advance (before you ever see the apartment), and cancellation fees apply. This was a concern for me the first time, but now having stayed there, I have no hesitation whatsoever. I do recommend you take the travel insurance, because you never know when your plans could be disrupted due to illness, job loss, etc. Paris Perfect has links to a travel insurance provider, or search online. The Paris Perfect management office is just a few blocks away, open 7 days a week, and the staff was pleasant and helpful. We had a tricky latch on the French door leading out to the balcony (did I mention the balcony overlooks the Eiffel Tower?) We called for help, and the latch was fixed before we got back from sightseeing. All apartments are non-smoking, and no pets allowed. Rentals are for a one week period, and I do recommend you take the full week. There is so much to see and do in Paris, plus you can take 3 wonderful day trips depending on the season (Versailles, Champagne region, and Monet’s Gardens at Giverny). If you find it impossible to stay a full week, and are booking towards the last minute, Paris Perfect might be able to consider a shorter stay, so call and ask. They may be able to accommodate you. However, there is one huge drawback to staying in a Paris Perfect apartment which I must warn you about. 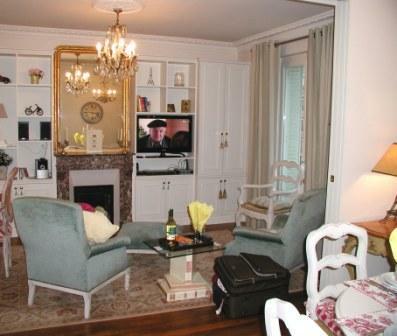 The apartment is so gorgeous, you may never want to leave! I am not exaggerating. 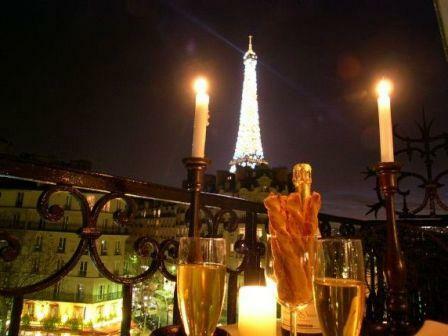 In the evening, gather at the window at the stroke of each hour to watch the Eiffel Tower sparkling light show. We have magical memories of our children watching the clock, counting down the minutes to the top of the hour, and dashing to the window to see the Great Lady sparkling in the night. On your morning of departure, you will feel a little like Cinderella, when reality hits you that you have to leave – your royal coach about to turn back into a pumpkin, and white horses back into mice. Ahhh, but that’s what vacations are about. Fairy tales can come true. And there will be a happy ending, because you will promise yourself to return to Paris again! * Prices quoted are for low season. They also have special sale prices available now for a limited time for high season and shoulder season too. Check Paris Perfect website for details. In the interest of full disclosure, as a returning guest of Paris Perfect, I received a promotional discount, however, my review is honest and unbiased, and not influenced by consideration received. This entry was posted in France, Paris and tagged apartment, Bourdonnais, Champ de Mars, Clairette, Ecole Militaire, eiffel tower, Left Bank, Metro, Paris, Paris Perfect, Pont d'Alma, Rapp, RER, Rue Cler on January 27, 2010 by enchantedtraveler.